Never before in the history of humanity have so many people been lied to or manipulated on a daily basis. During the recent election, we saw billions of dollars of engineered bullsh*t in the form of political advertising. Add the usual parade of sugary drink marketing, bikini babe advertising, and biased "reporting" ... and we're facing the perfect storm of bullsh*t.
In this interactive book reading*, Rohit will offer a look at the entertaining (and sometimes tragic) rise of propaganda in history ... as well as how social media has contributed to the problem. 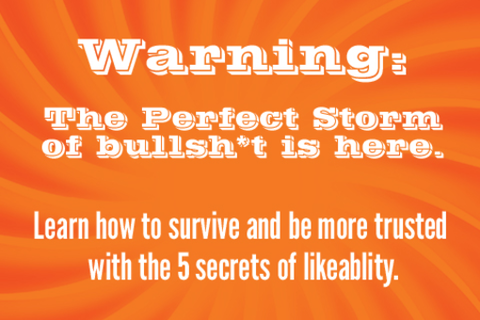 From the lessons of CIA body language experts to the secrets of the "lie doctor" - this session influenced by the #1 best selling book Likeonomics will offer a new hope for a bullsh*t free future and what it will take to make it a reality. Rohit Bhargava leads the Influential Marketing Group and is an independent marketing expert focused on helping to bring more humanity back to business. For the past decade before starting his own “concierge marketing” consultancy to work with brands on a more exclusive one to one basis, Rohit led branding, digital and social media strategy for dozens of the biggest brands in the world through leadership roles at Ogilvy and Leo Burnett marketing agencies in the US and Australia. He is the best selling author of two books (including the recent global marketing best seller LIKEONOMICS), a non-boring keynote speaker and Professor of Global Marketing at Georgetown University.